No marshmallows or butter found in this recipe. Only whole grain brown rice cereal and other whole ingredients. 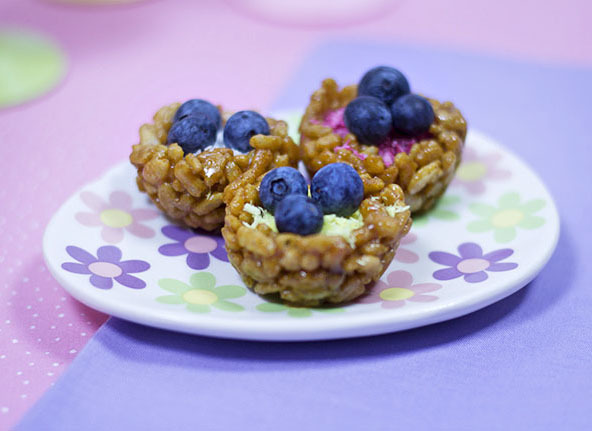 Barbara’s brand of brown rice crisps and Trader Joe’s Chocolate Sunflower Seed Drops along with other whole ingredients make these Rice Crispy Treats colorful and oh so good! Add the almond butter, liquid sweetener of choice and coconut butter to a large pot and slowly melt and stir the ingredients together over low heat. The purpose is to get it just warm enough to melt the ingredients together. Remove from heat and add the vanilla and sea salt (only add salt if using salt free almond butter). Stir in the brown rice crisp cereal. If shaping into Easter Eggs or another mold see Variations below. Prepare an 9" x 13" pan by spreading a thin layer of coconut oil on the bottom and up the sides. A glass or ceramic baking dish work well. Spread the mixture into the pan. You could sprinkle chocolate chips or chocolate covered sunflower drops on top and lightly press on top with your fingers if you desire. Otherwise just flatten mixture with a spatula. Then place in the refrigerator for 15-20 minutes (to stiffen up) or until ready to serve. They do keep well at normal room temperature though once hardened due to the coconut butter. Melt dark chocolate chips in a double boiler or chocolate melting pan. Transfer chocolate to a food grade squeeze bottle or frosting bag with a small round tip. 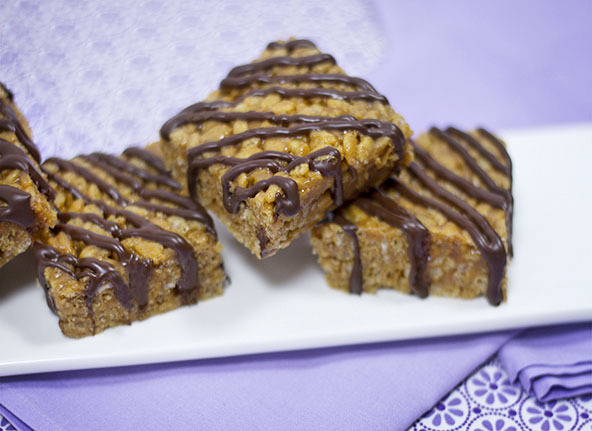 Drizzle chocolate over the top of the rice crispy bars. You can drizzle chocolate over the top before cutting them into bars and place back in the fridge to set the chocolate or cut the bars first and then drizzle the chocolate on like I did here. I got these ingredients at my local stores for quite a bit less than what Amazon charges. Prepare the rice crispy mixture from the recipe above. The mixture can be a little too sticky to handle at first. Placing it in the fridge for a few minutes will stiffen it up enough to work with but watch out because it can get too stiff when it gets too cold. You need it sticky enough so that the sunflower seed drops will stick to it. Line the plastic Easter egg with coconut oil to start. I found that I didn’t have to do it each time I used the mold. 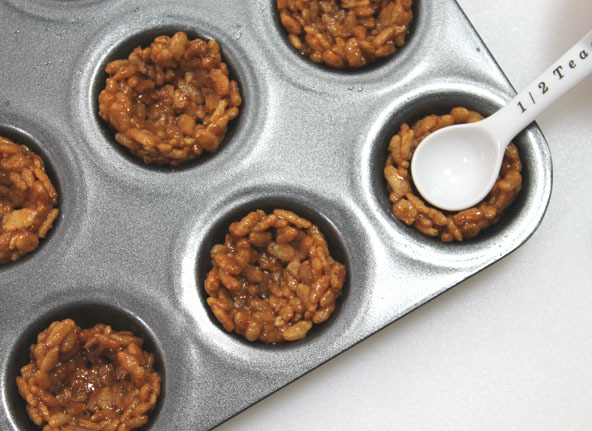 It’s easiest to forgo the sunflower seed drops and just pack some of the mixture into the egg mold and squeeze the top and bottoms together until the egg closes. Remove the mold and place in an empty egg carton. You can stir the sunflower seed drops in first with the mixture but they tend to crack and not enough of the seeds end up showing on the outsides. Pour the sunflower seed drops in a small bowl. Grab a small glob of the rice crispy mixture and dip it into the sunflower drops. If the mixture is sticky enough the drops will stick. Place the mixture in one end of the mold and then do this again in the other end of the mold. Hand place drops on the sides of the molds to fill up the spaces. It’s a little challenging to get just the right amount in to squeeze the egg mold together without cracking the chocolate drops but I managed to do it and I think they turned out pretty cute. They really taste good too. 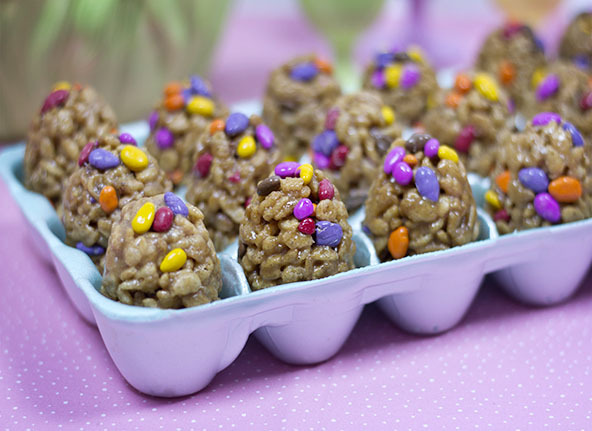 Another option for the sunflower drops is to omit the sunflower drops in the mixture, mold the eggs, let them set to harden, dip the tops of the eggs into dipping chocolate and sprinkle the tops with the sunflower drops. This is a lot easier to do and a lot more fun for kids. 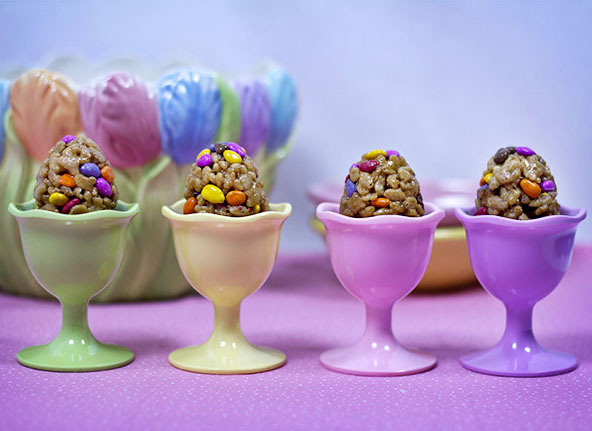 Here is another idea for shaping Rice Crispy Treats for Easter. Fill the nest with whipped cream or coconut cream topped with coconut sprinkles and small blueberries. You can shape these Rice Crispy Treats into anything you want for any Holiday or celebration.